For the busy brew master who is always on the go, there is no greater item then a portable oak barrel. But where, oh where, could any intrepid individual find an oak barrel that that is both effective and portable? Why, right here, of course! 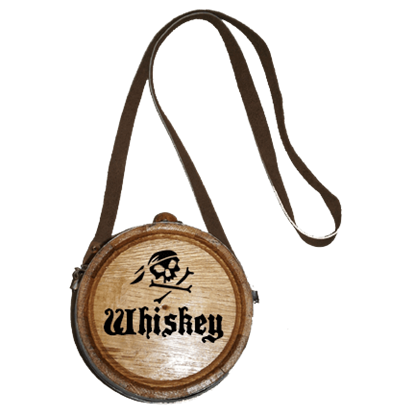 In addition to our effective and tasteful oak barrels and bootleg kits, we also offer a number of mugs and canteens, which you will find are perfect for enjoying your own tasty brews as well as for transporting your ultra-tasty aged spirits to a number of fine imbibers. Our intriguing selection of canteen barrels are hand crafted from American white oak and feature a medium toast. They hold approximately 1 liter of liquid and are perfect for aging and transporting any of your spirits of choice. Each canteen barrel includes a bung and a shoulder strap, which makes transportation a breeze. 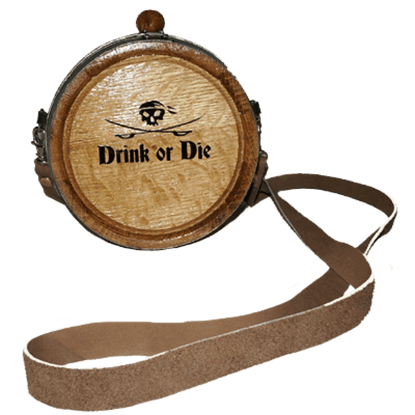 Many of our canteen barrels are also laser-burned with pirate symbols and script, making them perfect for pirates who absolutely have to have their favored spirits with them at all times. And not only are any of our mugs and canteens great for pirates, but they are also perfect for Vikings and reenactors who like do things the old way or who just happen to like flavoring their own spirits. So if you want to age and flavor your spirits and share them abroad, our oak canteens and mugs are perfect for you. The canteen barrels are handcrafted from American White Oak and have metal hoops. This canteen barrel has laser burned pirate font that says Drink or Die on the front of the barrel along with a skull and crossed saber design. The canteen barrels are handcrafted from American White Oak and have metal hoops. This canteen barrel has laser burned pirate font that says Poison on the front of the barrel along with a skull and crossbones design. This canteen barrel is handcrafted from American White Oak and has metal hoops. This canteen barrel has laser burned pirate font that says Tequila on the front of the barrel along with a skull and crossbones design. The canteen barrels are handcrafted from American White Oak and have metal hoops. This canteen barrel has laser burned pirate font that says Whiskey on the front of the barrel along with a skull and crossbones design. Our oak canteen barrels are perfect for the full time re-enactor who likes to do things the old way. This canteen barrel is unadorned, giving it a classic look that can be admired or customized. The canteen holds approximately 1 liter.